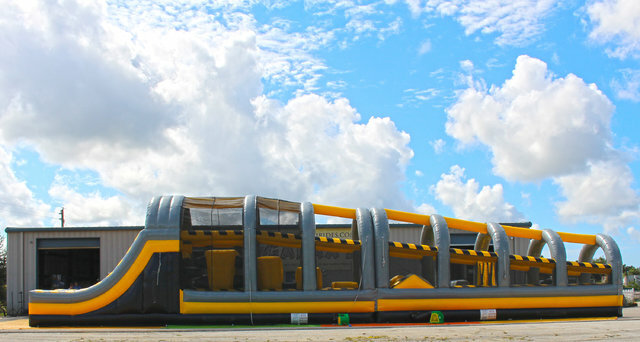 The Toxic drop obstacle course is an incredible inflatable that spans a massive 88 feet in length, providing you and your guests with plenty of challenges to overcome! This enormous obstacle course features the “toxic,” industrial inspired color scheme and includes plenty of arches supported by mesh nets so that you can keep track of the action inside and outside of the obstacle course! Bring an unforgettable experience to your next celebration with the toxic drop obstacle course and book it today! We always guarantee on-time, no-hassle delivery and setup! Include any relevant delivery notes when submitting your order and if your event is on a Saturday, be sure to note if a Friday delivery works as well (when available, and at no extra cost)!